Syrian refugees gather outside their shelters following a winter storm which brought rain and snow, at an informal settlement in Haoush Harime, in Bekaa Valley, Lebanon. Storm-force winds and snow across Lebanon have worsened the plight for tens of thousands of Syrian refugees who’ve been forced from their homes by nearly eight years of conflict, a top UN humanitarian official said on Thursday. Speaking to journalists in Geneva, Philippe Lazzarini, Resident and Humanitarian Coordinator for Lebanon, said that refugees had been moved from shelters - including in the exposed Bekaa valley where wintery conditions are especially acute - to safer facilities, after Storm Norma hit at the weekend. “Some of the settlements have been completely flooded, very cold, it’s extremely inclement conditions, and to describe daily life, it’s just miserable,” he said. Although the number of Syrian refugees officially hosted by Lebanon is more than 900,000, registration ended in 2014, and it is estimated that the real figure is between 1.2 and 1.3 million. Around 70 per cent live under the poverty line, Mr. Lazzarini said, noting that this was in fact an improvement on 2017, when the number was even higher. This high ratio of refugees to nationals – around one in four – would be “unthinkable and unacceptable” anywhere else, the UN official said, before playing down “tensions” between host Lebanese communities, 10 to 20 per cent of whom live below the poverty line. Rejecting suggestions that the refugee situation alone was responsible for discontent within the country, the Resident and Humanitarian Coordinator noted that its leaders have been in “deadlock” and unable to agree on a power-sharing arrangement for effective central governance, despite elections last year. International support and solidarity for the Lebanon situation remains strong, Mr. Lazzarini insisted, amounting to up to $1.5 billion per year since 2015. Nonetheless, he cautioned that eight years into the crisis, humanitarian funding “might have reached a ceiling” and that other longer-term development funding may need to be found, notably for education projects requiring a minimum four-year investment. Asked about how many Syrian refugees have chosen to return to their war-scarred country, the UN official explained that only 16,000 to 17,000 registered with authorities in Damascus during 2018 – a slight increase on the previous year, when no more than 13,000 went home. Suggestions that the UN had prevented people from doing so were incorrect, he insisted, noting that the organization ensured that returnees had all the “necessary documentation” they needed, such as birth and marriage certificates, to avoid difficulties reintegrating back into Syrian life. Latest UN figures indicate that there are more than 5.6 million Syrian refugees outside the war-torn country; Turkey hosts most, at 3.6 million. Next is Lebanon, at more than 900,000, followed by Jordan (670,000), Iraq (250,000) and Egypt (130,000), while North Africa shelters 35,000. 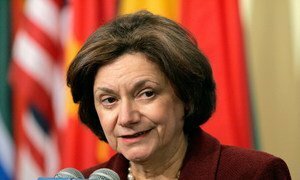 As the world – and the United Nations – continues to grapple with political crises, we look at the political landscape with Under-Secretary-General for Political Affairs Rosemary DiCarlo. We begin by asking her what it’s like to be the top UN political officer. 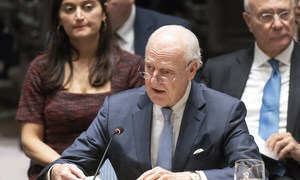 Addressing the problems plaguing Syria and bring years of brutal fighting to an end, requires further “genuine effort” on the part of influential countries, to talk to each other and work constructively, the veteran United Nations Special Envoy for Syria has said.